Although not as iconic as the Golf, the Polo is arguably one of the more legendary Volkswagens, especially in Europe. Having followed in the footsteps of the Golf in terms of design in recent decades, the Polo has become the most popular subcompact on the Old Continent, and the fifth-generation model posted some impressive sales figures, even as it became nearly eight years old in 2016. But come 2017, and Volkswagen unleashed the sixth-generation Polo, an impressive hatchback that promises even more success for the German brand. Although it sports an evolutionary design that’s fresh but far from outstanding, the new Polo is a noteworthy machine on the inside. Gifted with an exciting interior design and more technology than anything else in this niche as of 2017, the Polo is once again the leader of the subcompact market. And the redesign arrived just in time, as both Ford and Kia upgraded the Fiesta and Rio for the 2017 model year. How does it compare to its main rivals in Europe? Find out in the detailed review below. Check for Car Loan Interest calculator at Fincarz. Exterior looks have not changed much, and the family identity is still very much there. At the front, the three-strip chrome grille has been replaced in favour of a single-slat chrome grille. The company has toned down the usage of chrome in and around the front grille, which makes it look bold and rugged. The hatchback boasts an all-new front bumper, which compliments well the aforementioned thick striped grille around the air dam. The headlamp cluster along with the twin fog lamps looks good, although disappointingly daytime-running lights (DRL) has been left out this time. The Polo also benefits from an all new set of alloys and body-coloured door handles. The design of the tail-lamp cluster has also been tweaked slightly. Every change done to the exteriors, as mentioned before, are very slight and will only be noticeable to the practiced eye. Else, they are minor – an oh, of course – a new colour Copper Orange is added to the prevailing shades of Candy White, Night Blue, Flash Red, Carbon Steel, and Reflex Silver. Talking about the cabin, it’s neither too spacious nor cramped but people looking for rear seat comfort for 3 adult passengers, might get disappointed. The space at the front, however, is better and on par with the rivals in the segment. The two-tone colour theme of the cabin is elegant with the centre console finished in silver that appears pleasant to the eyes. The set of air cons located at the top of the center console is angled towards the driver giving utmost driving comfort. For the feeling of more premiumness, the flat bottom steering with mounted audio controls is wrapped in leather while chrome highlights add to the richness. Below the air cons, is the new touchscreen infotainment which let you pair your Android and Apple smartphones for music and telephony. The system also supports MirrorLink which let you mirror your smartphone screen on the display of the infotainment. One can also synchronize music with the option of USB, Aux-In, Bluetooth and SD Card connectivity. Move down further and you will see the climatronic air conditioning system that also has its own dedicated display. There is a large open space below the centre console where you would like to stash your small important belongings and spare items. No fewer than six different gasoline options are available, starting with a 1.0-liter turbo that comes in four flavors.The previous Polo had a diverse engine lineup and the brand-new model promises to be just as versatile.No fewer than six different gasoline options are available, starting with a 1.0-liter turbo that comes in four flavors. The base unit cranks out 65 PS, but Volkswagen also offers variants with 75, 95 and 115 PS. The five-speed manual is standard on the first three, while the most powerful uses a six-speed manual. The 95 and 115 PS versions can also be selected with the seven-speed DSG.Next up is the 1.5-liter TSI, which is rated at a solid 150 PS. If you’re looking for more oomph, the 2.0-liter TSI in the GTi model delivers no less than 200 PS. Both the 1.5 and 2.0 can be had with either the six-speed manual or the seven-speed DSG. For the first time ever, the Polo can also be purchased with a natural gas drivetrain.Moving over to diesels, there’s a new 1.6-liter TDI engine. The base model gets 80 PS, while the more expensive option puts 95 PS to the ground. The former comes with a five-speed manual only, while the latter can be paired with the same manual or the seven-speed DSG.For the first time ever, the Polo can also be purchased with a natural gas drivetrain. The engine is called the 1.0 TGI, cranks out 90 PS, and mates to a five-speed manual. There isn’t much info available at this point, but Volkswagen says that the 1.0 TGI “can be CO2-neutral, depending on the energy source.” It’s safe to assume that it will be fuel efficient too. The Polo hatch on road behaves like a typical European vehicle. The solid built and excellent composure gives big-car like ride quality while the well-tuned suspension set-up is perfect for the Indian road conditions. The car boasts of mature road manners. Take it to the corners and you will realize that it offers nice stability and minimal body roll. The vertical movement, unlike its tallboy competitors, is also minimum. The grip levels are also fantastic even if you push it hard.The steering wheel is light for urban road conditions but at the same time, it is communicative. Whether you are on the back seat or the front or even uneven road patches, the ride quality stays flat. European car manufacturers never skimp on safety, and this is more than evident in the Polo, which now comes with dual front airbags as standard. The braking system comprising of ventilated discs up front and drum in rear wark fairly effectively, and the Comfortline and Highline versions also get an Antilock Braking System (ABS). Additionally, there are 3-point front seat belts, 3-point rear outer seat belts, lap belt in the middle, speed-sensing auto door locks, fog lamps and many more features to ensure maximum safety of the occupants. To protect your precious investment, every Polo comes with an engine immobilizer and alarm with floating codes to make thefts difficult. Volkswagen Polo On-Road Price in Hyderabad ranges from 6,29,406 to 10,26,981 for variants Polo 1.2 Trendline Petrol and Polo 1.5 AllStar Limited Edition respectively. Volkswagen Polo is available in 11 variants and 5 colours. Below are details of Volkswagen Polo variants price in Hyderabad. 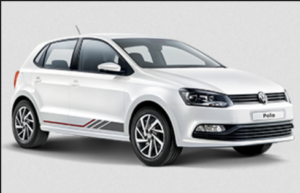 Check for Volkswagen Polo price in Hyderabad at Autozhop. As one of the most popular vehicles in its niche, the Volkswagen Polo needs to deliver an outstanding package with each new generation. It’s what customers expect, and needless to say, Volkswagen upped the ante in every department in recent years. The sixth-gen Polo seems to be no exception from that rule and I think it’s the biggest step the nameplate has made up on the quality ladder. The amount of technology is impressive for this niche, which the new interior design is as attractive as it gets. And from the looks of it, the Golf has nothing on the Polo as far as premium features go. Granted, the exterior is just a revised version of the old car, but that’s not to say that it lacks modern touches and the freshness a new car must have. It might be a bit more expensive, but it’s definitely a winner if you’re looking for the best technology in town.